Don’t know if it’s right but HRRR and HRDPS is colder for Richmond. I'd hate to be a local met. 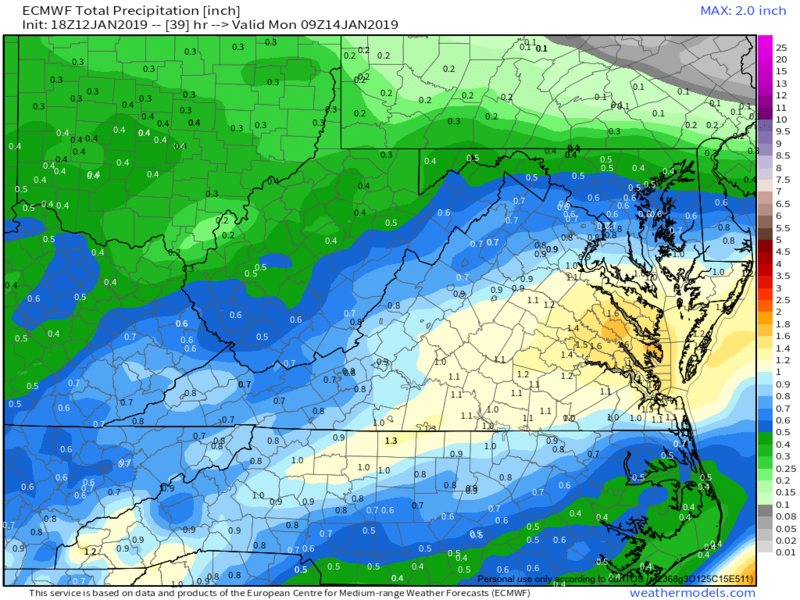 Somewhere within 30 miles of Richmond is going to get 6-8"+ and somewhere within 30 miles is going to see nothing but rain. 2-3” before mixing starts probably? Just saw an update on NBC 12. They are still bullish for 4-8 for Hanover, Western Henrico, Goochland etc. Could see changes back and forth. got about a half inch on the deck. Really hope we can stay all snow for as long as possible. We have about an inch or so here in Prince George too. DT messaged me earlier and said he had 1" also in Chester. Weird as Eagles fans. I kind of want to play Dal for revenge IF we beat Saints, but find myself rooting against them. I don’t like the Rams either lol. Of course.. but prob could fill half the stadium with Eagles fans in LA..
Looks like its starting to come down good enough to accumulate again here now..
Of course.. but prob could fit half the stadium with Eagles fans in LA..
And they will! I was at the game in London. Eagles fans took over of course. Probably 70/30 for a Jville “home game”. They had all the bells and whistles as the home team but Eagles fans made it a home game in UK. ok only weather after this. Just had to man! Snowing nicely here. looking like Prescott wont be on the field in the next game to worry about him... owell..
Intellicast radar show all snow over me here in PG (blue, not pink), but there is indeed sleet mixing in with the snow now. I started to hear the pinging on the window and was surprised due to the fact radar shows no mixing anywhere near me.